Bo Horvat scored twice, Jacob Markstrom settled down to make 33 saves after allowing a goal on the game's first shot, and the Vancouver Canucks beat the Edmonton Oilers 3-2 on Saturday night. Brandon Sutter also scored for the Canucks, the last team in the NHL to start their season. Kris Russell had a goal and an assist, and Ryan Nugent-Hopkins had the other goal for the Oilers, who opened their schedule with a 3-0 home victory Wednesday over the Calgary Flames behind Connor McDavid's hat trick. Cam Talbot allowed three goals on seven shots before being lifted early in the second period. Laurent Brossoit stopped all 19 shots he faced in relief. Travis Green made his debut as an NHL head coach behind the Canucks' bench as Vancouver picked up its first regulation win over Edmonton since Nov. 19, 2014. With his team up 2-1 after the opening period, Horvat scored his second of the night 32 seconds into the second period when he won a puck battle behind the net before his wraparound shot somehow snuck between Talbot's pad and the post. Horvat, who led the Canucks in scoring last season, sustained an upper-body injury during the exhibition schedule, but showed no ill effects against the Oilers. 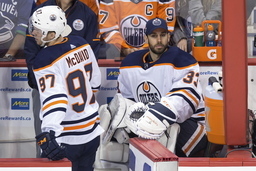 The Oilers opened the scoring just 1:08 into the game on the first shot when Russell, who scored just once in 68 games all of last season, snapped a puck from the top of the circle off the rush that went between the legs of Vancouver defenseman Erik Gudbranson and past a surprised Markstrom. The Canucks responded on the power play at 7:35 when Horvat powered past Matt Benning before chipping a shot shortside on Talbot. Oilers: Host Winnipeg on Monday night. Canucks: Host Ottawa on Tuesday night.